From our previous analyses, it appears that proximate ecological factors do not provide a full explanation for strepsirrhine hypometabolism. Consequently, we next considered whether the distinctive metabolic pattern of strepsirrhines is a primitive trait that is shared with other closely related mammalian species. 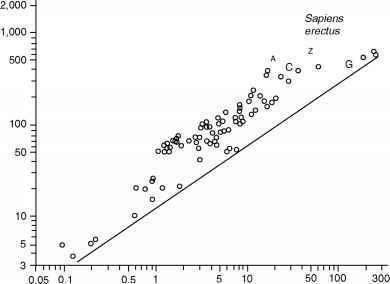 To evaluate this explanation, we considered metabolic data for selected nonprimate species (Figure 3). Figure 3. Log10 plot of RMR (kcal/day) versus body mass (kg) for selected bat (order Chiroptera; n=46) and tree shrew (order Scandentia; n=2) species. Also shown is the Kleiber equation (RMR=70M0 75). Bats have metabolic rates that average 10% below those predicted by the Kleiber equation, though this masks considerable variation found within the order. Bats are not hypometabolic by previously described criteria. 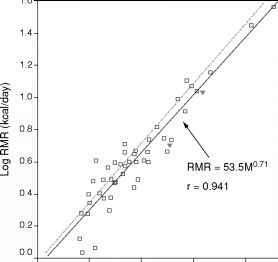 The scaling relationship between RMR and body mass in bats is: RMR = 53.5M071. Microbats (n =34) have metabolic rates nearly identical to megabats (family Pteropodidae; n =12) and a similar range of variation in body size is seen within the two groups. Microbats on average deviate from that predicted by the Kleiber equation by -10% and megabats deviate by on average -9%. 5 The body mass for this species is not given in the original publication (Bradley and Hudson, 1974) and was obtained from McNab (1988).